The Day the Music Lived – John Duggleby. 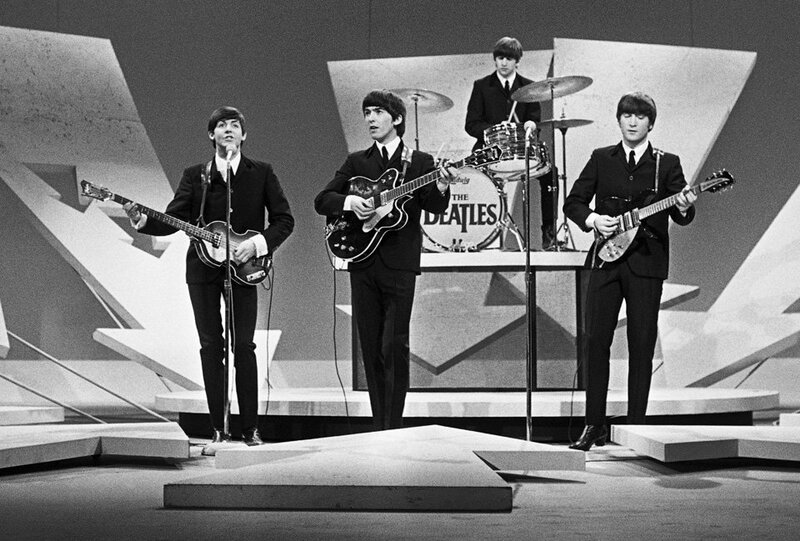 Don McLean’s “American Pie” pronounced Buddy Holly’s sudden 1959 death as “The day the music died.” Perhaps so, but nobody my age will forget 50 years ago today when it came roaring back to life with the Beatles’ first appearance on The Ed Sullivan Show. We kids and our families were still reeling from another unforgettable event, President Kennedy’s assassination little more than 100 days earlier. But thanks to a massive musical marketing campaign that ranks among the Fab Four’s many firsts, a record 73 million Americans hovered before their tubes that evening, anxious to see what the fuss was about. Boy did we find out. I won’t attempt to reconstruct the electricity of the Liverpudlians’ five songs before a screaming studio audience. If you were there, you know. If not, you have probably been bludgeoned to tears by Baby Boomers like me about its significance. Suffice it to say that John, Paul, George and Ringo never again needed to have their names keyed before their faces (including, much to Lennon’s chagrin, the addition of “Sorry, girls, he’s married”). When the Beatles hit, America was in the throes of a hootenanny craze that put folk music front and center stage. I was barely 12, singing and playing hand percussion with two other boys in sort of a baby Kingston Trio. We played 15-minute sets as the opening act of hootenannies around eastern Iowa. We were more cute than good, but it was heady stuff for this corn-fed kid. My personal highlight was talking at length backstage one evening to a large, kindly woman from a Greenwich Village trio that suggested Peter, Paul & Mary. I couldn’t believe that this diva from the epicenter of Folkdom was tolerating a little hick twerp like me. I didn’t remember her name, but I certainly recognized her face when she resurfaced a couple years later– again on the Ed Sullivan Show– as Cass Elliot of The Mamas and Papas. But I digress. Within six months of the Beatles’ Sullivan appearance I was off the hootenanny circuit, banging on a drum kit in one of the gazillion garage bands spawned by the Moptops. We called ourselves The Dodge Boys because the keyboardist’s dad owned a local car dealership and bought most of our equipment. We played absolutely no folk, but lots of Beach Boys, Stones, Byrds, Kinks- and of course the Beatles. Though The Dodge Boys crashed not long after the ad campaign that inspired them, the Beatles have been constant companions on my “Long and Winding Road.” I’ve since come full circle musically and cover lots of genres– including folk– but the Fab Four more often than not find their way into my setlists. The Beatles have also grown and spread through my life like my hair (I still have it– yippee!) in countless other ways. Over the years I saw surviving Beatles Paul and Ringo, and wrote a book for young people called, Revolution: The Story of John Lennon (Imagine was my first choice but Yoko has it copyrighted– I kid you not). I even married a girl named (Hey) Jude, who will be my date tonight as we watch the TV special on this day that changed everything.